At the same time, many commercial organisations wanted to use radio to promote their products and services. Commercial radio was by now a huge success in North America and much of Europe, so people started to look at how to provide such a service for the UK. In 1923 the Daily Mail started a 1 year agreement to broadcast concerts from The Netherlands in English. The broadcast were discontinued following complaints from listeners in Holland that their own radio station wasn't broadcasting in Dutch. In 1925 Captain L F Plugge purchased 15 minutes of air time from a transmitter in Paris at the Eiffel Tower. Plugge produced a programme about fashion which was sponsored by Selfridges Store in London. Unfortunately there was very little advance publicity, and the broadcast was not a huge success. In 1927/8 a series of sponsored concerts were broadcast from Hilversum in Holland, in 1929 the Vocalion Record Company sponsored record programmes on Radio Toulouse and in 1930 Decca records sponsored programming from Radio Paris. At this time the BBC consisted of a series if 1.5kw regional stations located in large population centres. In 1925, after tests at Chelmsford, a 25kw longwave transmitter was opened in Daventry covering most of Britain. This allowed the BBC to open a new National service and in 1929 construction commenced on a series of powerful twin transmitter stations to carry the two BBC channels. In 1930 Captain Plugge set up The International Broadcasting Company to record programmes in Britain to be aired by stations in France. The first broadcast took place on October 11th 1931 when Radio Normandie broadcast a concert to Britain. The broadcast was successful, and nightly programmes followed. The IBC soon had several stations in France, Spain, Italy and Yugoslavia beaming programming to Britain. These broadcasts by the IBC were immensely popular both with listeners and advertisers. The British authorities tried to insist that it was illegal for people to listen, as their wireless licence only covered broadcasts from the BBC. There was talk of trying to negotiate an international agreement to ban cross border broadcasting, though this came to nothing. The authorities persuaded the Newspaper Publishers Association to ban all newspapers from printing details of the IBC programmes. As newspapers were competing with the IBC for advertising revenue, they were happy to agree. The IBC undeterred, started it's own programme listing magazine Radio Pictorial. Up to now all the IBC broadcasts had been on Medium Wave which had restricted range during daylight hours. As a result, almost all of the programmes were transmitted in the evenings. The exception to this was Radio Normandie which carried English programming during the day on Sundays. These broadcasts were extremely popular, as the BBC restricted it's output to religious programmes on Sundays. Unfortunately, because of the restricted daytime range, reception was limited to southern England. All this was to change in 1933 when the IBC negotiated with Radio Luxembourg to use their 200kw Long Wave transmitter which covered most of Britain during the day as well as night. The British authorities immediately complained that Radio Luxembourg was using a wavelength which had not been allocated by international agreement. The BBC refused to employ any artist who had worked for Radio Luxembourg, and even persuaded the British Phonographic Industry to increase the amount it charged Luxembourg for broadcasing copyrighted music. Also in 1933, the Irish Free State opened Radio Athlone which could be heard throughout a large part of Britain. Soon their transmitters carried programming aimed at the UK. Many of the sponsored programmes were produced directly by advertising agencies in London. The J Walter Thompson agency opened a studio centre in Bush House near the Strand. The Studios were equipped with the latest equipment including Philips-Miller optical recorders, which at the time the BBC had only experimented with. By 1935 as IBC revenue reached £400,000, Radio Luxembourg decided to start producing it's own programmes, and by 1938 had an audience share of 45.7% on Sundays. It is a sign of the success of these continental broadcasts that more than 70 years later, a generation of pensioners in Britain still know the words to the Olaltiney's song! The IBC revenue soared to £1,700,000 in 1938, but there were dark clouds on the horizon. Incidentally, it is sometimes said that the term "to plug" comes from Captain Plugg's enthusiasm for commercialism. As Europe moved closer to a seemingly inevitable war, the government managed to squeeze out Lord Reith in June 1938, as it wanted more control over broadcasting in the event of war. With the outbreak of the 2nd World War, all the continental stations closed down, as their transmitters were requisitioned by govenments. At the same time the BBC Regional programmes were replaced with the Home Service, and the National Programme was replaced by the European and Forces services. The BBC also took over Bush House for it's overseas services. The transmitter of Radio Luxembourg was used by the Nazis to broadcast propaganda to Britain during the war and, following the liberation of the Grand Duchy by allied forces, was then used by the allies to broadcast propaganda to Germany. At the end of the war Europe was a very different place, split in two by the iron curtain. Even the "free" Western European governments held tightly onto their control of radio broadcasting. Winston Churchill wanted the powerful Radio Luxembourg transmitters to carry the new BBC World Service fed by landline from London, however he lost the 1945 election and the New Labour government didn't pursue it. In 1946 the old Radio Luxembourg returned, however Britain was virtually bankrupt following the war and British advertising was hard to find. Luxembourg decided to use the vast coverage of their LW transmitter for more commercially viable services and the English language service was firstly cut back and then relegated to a less powerful MW transmitter in 1951. Now on 208m medium wave, each evening. The Station of the Stars as it now called itself, was extremely popular, but reception was not as good as it had been. Europe was now filling up with very high powered stations which were causing interference to each other. To combat the interference stations increased their power further, creating more and more problems. The BBC Forces Programme had provided popular entertainment during the war, to keep morale high, and this had proved popular. With Lord Reith now gone, it was decided to continue to provide this type of entertainment and on July 29th 1945 the Forces Programme was replaced with The Light Programme. During the war the BBC had used a network of small transmitters throughout the country in order reduce the possibility of enemy planes using the BBC stations for radio location of targets. This network, known as Group H, together with a 30kw transmitter at Droitwich enabled the BBC to open The Third Programme, which provided a serious output of classical music and talks. 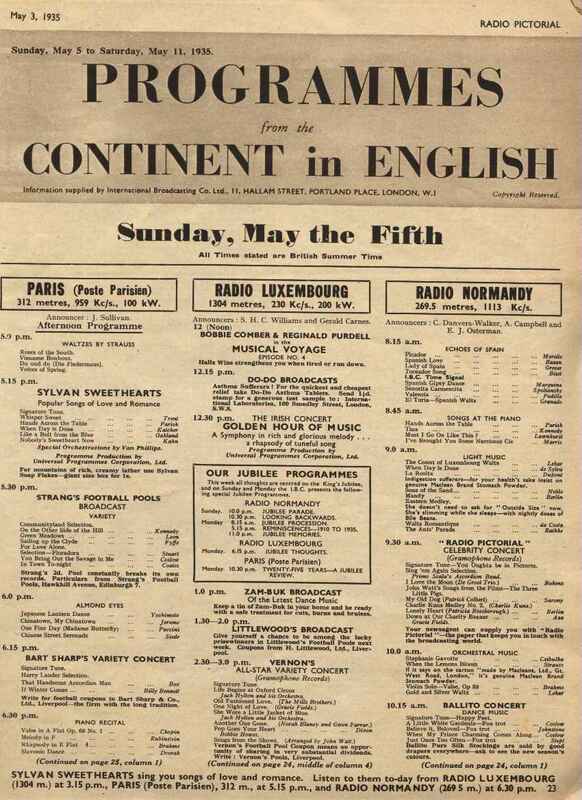 The Third Programme opened on September 29th 1946, however it never gained much of an audience, and was described by the press at the time as "unbearably dull and pretentious". It continues to this day as BBC Radio 3 in much the same vein. It is interesting to note that the BBC was prepared to provide a minority service with a hugely expensive national network, whilst denying the public popular music radio throughout much of the 50s and 60s. Incidentally, it had originally been intended to open The Third Programme using a 150kw transmitter on an 515m even though Latvia had been allocated the wavelength under international agreements. When Latvia started high power transmissions of it's own, the BBC was forced to use lower power, supplemented with the wartime Group H network. Even the BBC was happy to pirate other countries frequencies! Much of the effort which had brought us the continental stations before the war was now focused on lobbying parliament for the introduction of commercial television in Britain. Astonishingly they achieved this, and commercial TV broadcasts started in 1955. As well as Luxembourg, the principalities of Andorra and Monaco, broadcast radio to Britain in the 60s and 70s. These broadcasts took place after midnight when the air-time was cheap, and reception was reasonable, as most of the interfering stations had shut down for the night. Unfortunately the late hour restricted audiences, and the broadcasts were short lived.